For a truly modern look, clean lines and a touch of class its hard to ignore glass water features. In the garden, on a patio or indoors they add a sophisticated look to both landscape and interior design. Glass water features are one of the latest additions to the many designs available. And although many consist of toughened glass panels, a good variety are available including etched glass panels, rippled glass and custom designs with company logos. It is often glass combined with other materials such as stainless steel or rock that can make the most striking features. 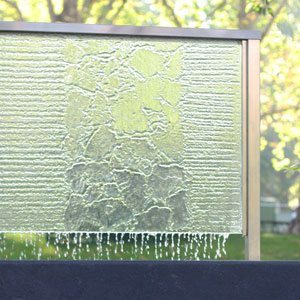 Most are ‘water walls’ however with slumped glass techniques now more common more interesting features are available and more affordable costs. Glass topped stone is a popular design. It is the clarity of the water flowing over glass that is the main appeal. Sleek modern lines that will fit in with so many landscape designs, both contemporary and classical. 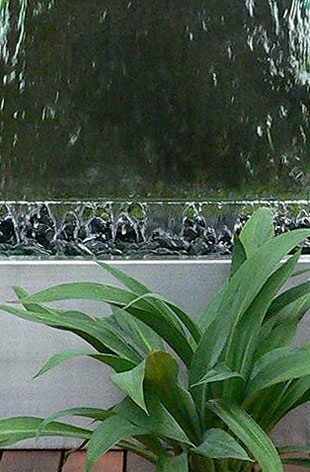 Glass panels used in water features can be etched with patterns of company logos to create stunning displays. As with all water features the basics are the same, a spillway to control water release, a surface for the water to run over and a pond or pool to catch the water for recycling through the system. Electricity to power the pumps, this can be low voltage or solar in some systems. 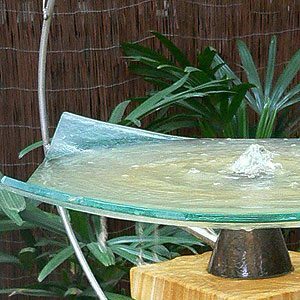 Is a glass water feature safe ? In many cases it is better to use a clear polycarbonate material or acrylic rather than glass itself to ensure strength and durability for outdoor use. These materials can also be easier to clean than some of the fragile glass products.